15. Closing Ceremony There will be no entry march for all nations in the closing ceremony. The closing ceremony has 2 vietory ceremonies (ladies and men). Before each ceremony the 3 medallists meet with their coaches just outside the centre. The medallists and coaches will march in together in the folIowing order: • The coach of the medallist of silver (with the national flag) • The medallist of silver • The coach ofthe medallist of gold (with the national flag) • The meda1list of gold • The coach ofthe medallist ofbronze (with the national flag) • The medallist ofbronze The three coaches (with the national flags) take position to the right ofthe rostrum, while the 3 medallists take position in front of the rostrum according to their placement. The medals will be presented as follows: • Gold: Member ofthe WTBA European Zone Presidium, Jacky Felsenstein • Silver: The President ofthe Danish Bowling Federation, Arne Hyldekrog • Bronze: President ofthe Fuen Bowling Union, Hartvig Fritzen • Flowers: Representative from the city of Odense After the presentation of the medallists and (the handing over of) medals, the National Anthem for the winning nation will be played. 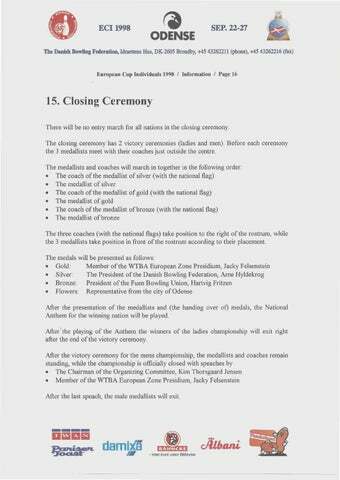 After the playing of the Anthem the winners of the ladies championship will exit right after the end ofthe vietory ceremony. After the vietory ceremony for the mens championship, the medallists and coaches remain standing, while the championship is officially closed with speaches by • The Chairman of the Organizing Committee, Kim Thorsgaard Jensen • Member ofthe WTBA European Zone Presidium, Jacky Felsenstein After the last speach, the male medallists will exit.